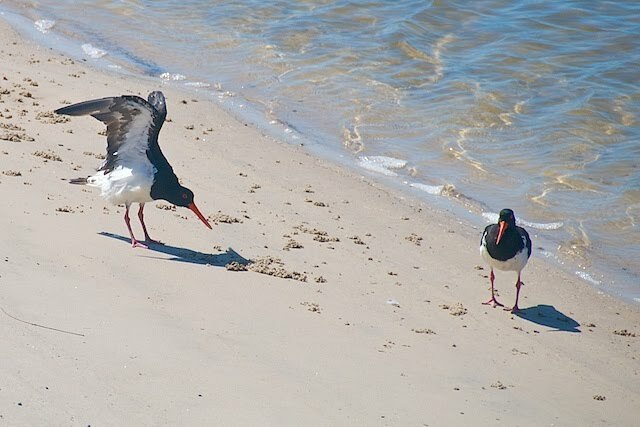 The Pied Oyster Catchers live on the island opposite, but they keep a keen eye on the soldier crab stocks at our place. Their beaks seem to be exactly the same dimension that a soldier crab lives below the ground, so it's easy picking for them. The soldier crab burrows are beginning to appear again, soon the beach will be crawling with them at low tide, and not long after that the stingrays will arrive, mining the beach at half tide, watching us watching them. They'll not leave a single crab or yabbie behind when they move on to more productive pastures, but eventually the cycle will repeat itself, the crabs, birds and stingrays will be back. Today there's a bit of anticipation happening. Tomorrow "their" people come to inspect. The die is cast, eh? It would be interesting to know how they determine a valuation other than just by the VG's land value. I gather all the houses will be bull-dozed. And you are all in the same boat ... I can see why you both find it depressing. One day, when it's over, I shall explain all. Suffice to say the valuation process is intended to be fair, but not all things fit into the square that has been drawn. Why oh why do we insist on doing things "differently"? JoJo and Papa, eh? Interesting combination. I watch with interest as the stories of the house and beach unfolds.